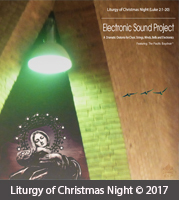 Liturgy of Christmas Night is a Christmas-themed album by Electronic Sound Project. Release date: November 26, 2017 (Free download BY-NC-ND 3.0). Inspired by Movies and a Radio Broadcast is a moody, cinematic ambient album with a strong neo-classical flair. Made by the Dutch recreational music composer and graphic designer Marc van Oers, aka Electronic Sound Project (ESP). Featuring James Hill on trumpet. Release date: July 22, 2017 (Free download BY-NC-ND 3.0). Follow ESPDomain.com also on our Facebook page for updated reports. ESPDomain.com is a non-commercial website. Do you have any questions about ESPDomain? Please send us an e-mail or use the contact form.